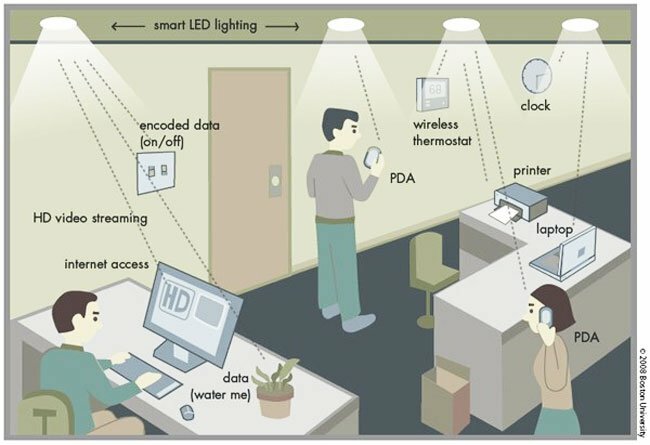 LED Light networks have been under development for sometime, but the Fraunhofer Institute for Telecommunications, Heinrich Hertz Institute HHI in Berlin, Germany has now been pushing the technology to its limits and is hoping to create a 800Mbps WLAN using the LED light network technology. Currently the optical WLAN co-opts white LEDs used for regular illumination to transmit data up to 100 Mbit/s, by flickering the LED’s more rapidly than the human eye can see. Devices are then fitted with a simple photo diode to receive the wireless connectivity, with each LED light providing around a 90 square foot range for connectivity. The team hope to be able to soon push the 100mbps to a whopping 800mbps, “Using red-blue-green-white light LEDs, we were able to transmit 800 Mbit/s in the lab” team member Klaus-Dieter Langer suggests. At the moment the system is still under development and the researchers do need to tackle the problem which causes the devices to lose connectivity if the photo diode becomes covered or shaded from the LED light.